The year is going along so quick and we are already in April. Thank you so much for a great celebration we had for our 15th anniversary of the church. What a milestone of God’s faithfulness. As we continue in the Spirit of Celebration, this month we celebrate a victorious life that we have, by the power of our resurrected Lord and Savior Jesus Christ. In this Easter season, please extend an invitation to someone to come to know Jesus. Together we can reach others with the gospel of Jesus. Lets do this together as a family. Happy Resurrection day! 04-05-2015 復活の力を受けた人生 - The Power of a Resurrected Life from New Hope Tokyo on Vimeo. 天国はあなたのために祈っている "Heaven Prays For You"
04-12-2015 天はあなたのために祈っている - All of Heaven is Praying for You from New Hope Tokyo on Vimeo. 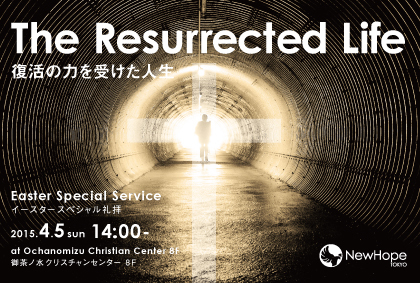 必要なのはイエス様だけ "All You Need Is Jesus"
04-26-2015 あなたには賜物が与えられている！ - You Have Been Given a Gift! from New Hope Tokyo on Vimeo.